IDentity Dance Crew Win National TitleOver 500 dancers from across 5 NZ regions gathered over the weekend to compete at the Street Dance NZ national championships. In front of a packed audience of nearly 2000, 2013 Adult Champions IDentity Dance Crew successfully defended their title and were named National Adult champions for the second year running. All crews were competing for places that qualify them to represent NZ at the World Hip Hop Championships held in Las Vegas in August. For the first year IDentity Dance Crew launched their own dance company ‘ID Co’ which included two junior crews Swagganauts & Shique. Three varsity crews – Excess, The Instigators and Steez, and their sister team Alias in the adult division. Five of their seven teams made National finals and ‘Alias’ took out the second place in the adult division. IDentity Co also entered a 30 strong mega crew, which placed third in the Mega Crew section. New Zealand has already gained a fierce reputation on the world stage with four crews across four divisions bringing home silver medals last year from the World Championships. THE ROYAL FAMILY choreographed by internationally renowned Parris Goebal took out the gold medal in the mega crew division for the third year running. Other teams from The Palace also took home second and third placings. The ID boys as first time competitors took out the silver medal in the adult division missing out on the gold by a mere 2/100th of a point. “We were stoked to be able to defend our title and to now have another opportunity to represent New Zealand on the world stage. The highlight this year was mentoring and developing other crews as part of ID CO. We are passionate about cultivating young up and coming dancers and seeing them learn what they are capable of achieving when they work hard” says ID leader Joshua Cesan. 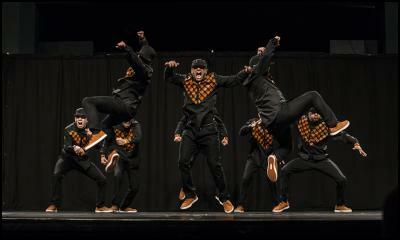 IDentity dance crew have also released their first concept video ‘Mind Control’. They are touring high schools across NZ with a teen suicide prevention campaign titled ‘UNDEFEATED’. Along with teaching weekly classes, gigs, university commitments and next week will be featuring in the ERUPT Arts Festival in Taupo as part of the very successful “Out Of The Box production.